A tandoori pot is fitted in a 304 Stainless Steel Barrel in a Plain Design with 3 Straps tied round its Top, Center and Bottom for reinforcement along with a provision of Ash out let. 4 S. S. Collapsible Handles are provided for Lifting, Pushing and Pulling. The Pot inside the Barrel is duly Insulated with Thermal Insulation, instant use type with 4 Heavy Duty Castors at the bottom making the unit Mobile. The top surface is covered with Insulation Blankets overlapped with Screwed Stainless Steel top. The Mouth of the Tandoori is lined with Stainless Steel Rim with 1″ depression having Heat Resistant Stone to avoid direct heat Transfer on the Steel top. 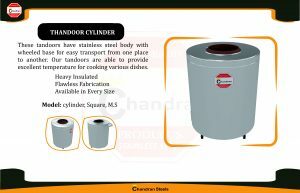 With the active support of our team of experts, we are engaged in Manufacturing and Supplying the most sought after range of ” chandran steels” The wide range of products offered by us include Juice Machine, Dining Tables, Kitchen equipment, Kitchen Sinks, Kitchen Trolley, Popcorn Maker, Display Counter, Cooking Range, Work Tables, , Steam Generators With Cookers, Multipurpose Cookers, idly Cookers, Masala Trolleys, Multi Bowl Sink, Work Table with Sink, Steam Generators, Sugar Cane Juice Machine, Citrus Juice Machine, Popcorn Machine. These products are cost effective and are also very easy to use and maintain. Being rust free and stain resistant, they are light in weight and user friendly in nature. With the constant support of our expert team, we are engaged in offering a huge assortment of Steel Tandoor Pot. This Tandoor Pot is designed to serve various industrial applications. Our Tandoor Pot is known for its easy usage techniques, consumes less energy and is highly appreciated for its optimum quality.